There is no escaping the Brexit rollercoaster. We read with interest this point of view from Stefan Legge, a postdoctoral researcher and lecturer in economics at the SIAW Institute of the University of St.Gallen in Switzerland. "The upside of Brexit: key lessons for Switzerland" gives commentary from outside the UK debate. A different world up with the cows near the Klausen Pass - the connection between Canton Uri & Canton Glarus. A vast alpine grazing area, which has both cows and sheep. Nearby is the glacier lake at the base of Mount Clariden. Alpine Butter - step away from the margarine. Step away from the margarine, the good news is we can eat butter again. "It's evident that Saturated Fat does not cause heart disease. We got it wrong and we need to move on." Alp butter (pictured), is made from the milk of cows which are taken up into the high mountain pastures to graze during the summer months. The cream is separated from the milk and churned into butter. Butter production is another source of income for the farmer/cheesemaker on the Alps - often they will also produce yoghurt for the local market. Give Radishes on a plate and eat the radishes with butter and salt. Put the leaves in a salad bowl. Mix them with vinaigrette and enjoy the peppery salad. Raclette is not just for winter. Raclette is eaten all year round in Switzerland - it's not just for the winter after a day spent on the ski slopes. Raclette grilled on the BBQ (on a dish or tinfoil), is wonderful on burgers. For an all time favourite, try Croûte au fromage made with Raclette. Heat the butter in a pan and toast the slices of bread. Sprinkle with white wine and place on a grill lined with parchment paper. For the filling, mix all the ingredients and spread on the slices of bread. Grill about 10 minutes in a preheated oven at 250 ° C, then serve. A green salad on the side makes a good meal. During the summer months, from mid May to mid October, is the time when this extraordinary Gruyère is made. At this time of year once the snow has melted, the farmers walk their cows up onto the high alpine pastures to take advantage of the abundant summer alpine grazing. It is here in the mountains, sometimes at an altitude exceeding 2000m in often ancient alpine chalets, that the cheesemaker works. 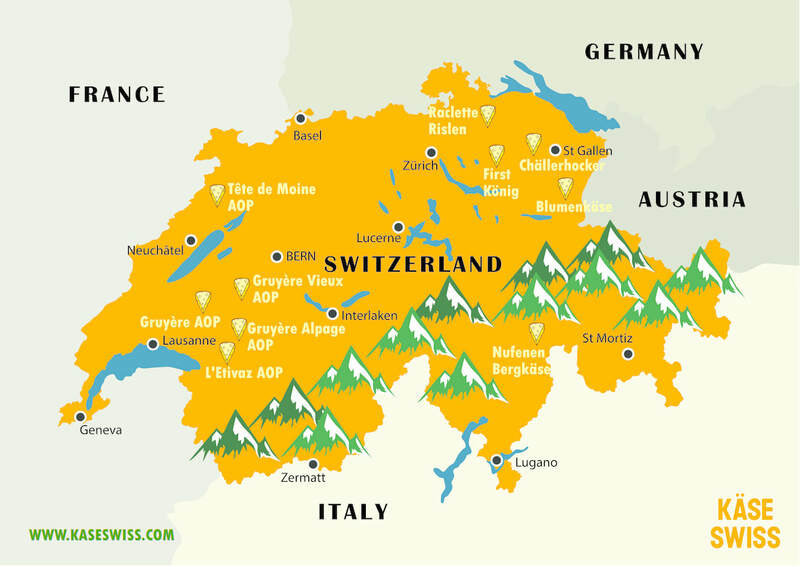 It is the botanic diversity of the alpine pasture which gives the milk, and consequently the cheese, it’s distinctive flavour. The family follows the cows and moves up into the mountains. They stay for these months in the Chalet where they sleep, cows are milked, and cheese is made. 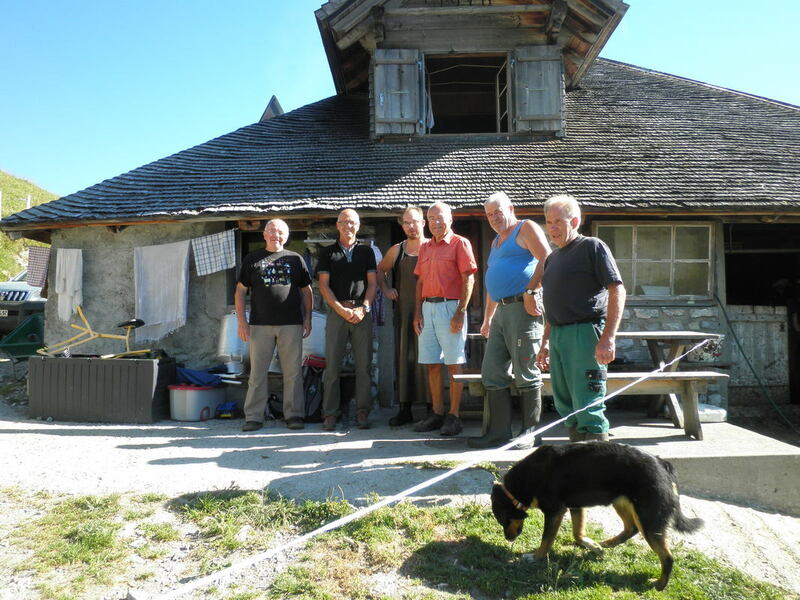 Life on the alps is labour intensive and often involves quite basic living conditions. The cows are grazed and bought to the chalet to be milked and cheese is made daily starting early each morning without pause. Within the chalet’s cheesemaking room is an area where a fire can be made on the floor. Each morning fresh milk is poured into a traditional large copper vat which is then suspended over the fire. The vat can be moved on or off the fire, depending on the point in the process of the cheesemaking and the heat required - and there is great skill involved in controlling the fire. The ceiling of the chalet comes to a high point above the fire - a form of chimney, blackened by years of fire, to let the smoke escape. The smell of smoke fills the room, and the spark of wood burning is constant. Production is limited. On average only about two cheeses are made per day. The cheese work is physical - the process and equipment not having changed much over time, but also there is the work of managing the herd, wood for the fire, and daily jobs around living in the chalet. The skill of the cheesemaker is paramount - the conditions are changing constantly; the pasture the cows are eating alters throughout the season, which in turn affects the milk; the weather conditions on the Alp can alter very quickly, altering temperatures in the cheesemaking room. So the cheesemaker has to balance these fluctuations to maintain the quality of the finished cheese. Cheeses are taken down the mountain when they are only a few days old to be matured in a central maturing house alongside the cheese of other producers. There has to be a close relationship between the cheesemaker and the affineur - they are both working together to ensure quality. Cheesemakers often have a life long commitment to sell cheese to one Affineur, and the Affineur in turn supports with training and advice. Peoples passion, skill, sense of tradition, and commitment to quality come together to enable the continued production of Gruyère Alpage - despite a new era where this form of food production is facing many challenges. The new season pressing of the Greek olive oil from Xristina will arrive in December, however there is no firm date yet. With lashings of olive oil in mind, Saveur magazine published this lovely soup recipe http://www.saveur.com/italian-bean-vegetable-soup-recipe There is no cheese angle here, but lots of oil and seasonal vegetables.